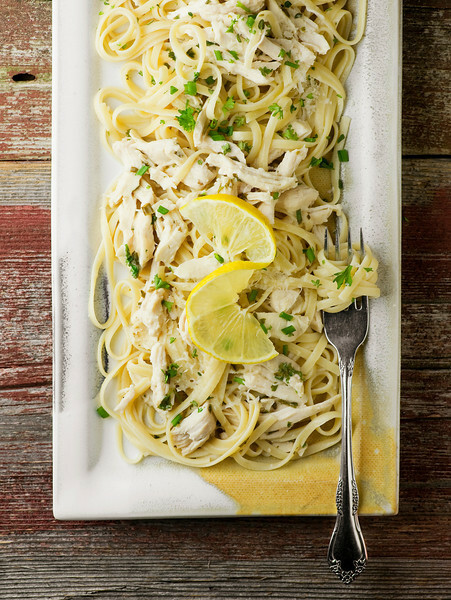 Turn leftover chicken into an easy elegant supper with a lemon and some linguine with this easy recipe for lemon chicken pasta. It’s so simple to make, and has a bright and cheery lemon flavor that will have them begging for another serving! There are a few recipes in my collection that are near and dear to my heart not only because they taste so dang good, but because they remind me of wonderful times. My mama’s cream scones. My grandmother’s molasses cookies. My baby girl’s favorite banana muffins. The back of the Nestle’s chocolate chip bag recipe for chocolate chip cookies that my friend Lynne and I have been making since we were nine years old. And this lemony, buttery, easy lemon chicken pasta recipe. I’ve made this about a million times over the years because it is so easy and delicious, but the time I loved best was on a winter weekend many moons ago up in Vermont with two of our best friends. 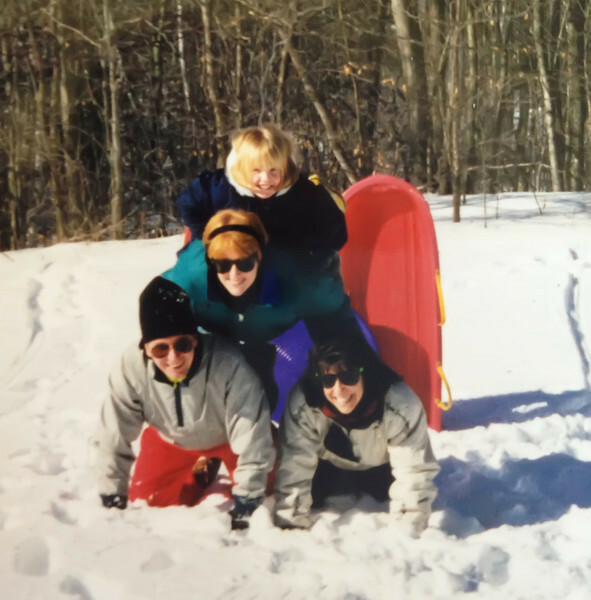 We all went up to my favorite place in the world, aka the Vermont Cabin. 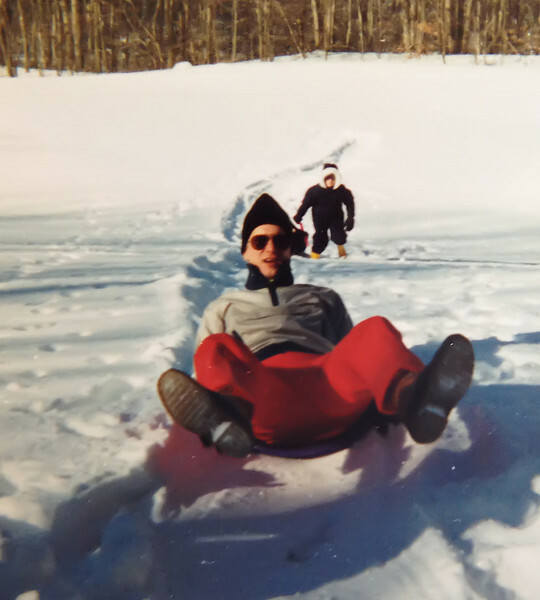 It was February, and it was Vermont, so there was snow. Lots of snow. 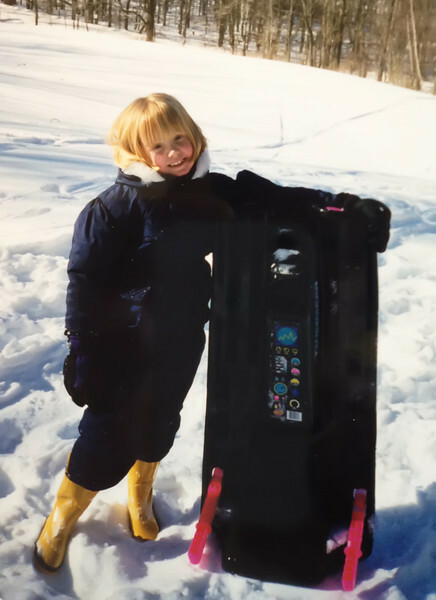 The Southern daughter was about five years old at the time, and like five year olds everywhere, she thought hurtling down the hill on her sled was pretty much the best thing she had ever done in her life. 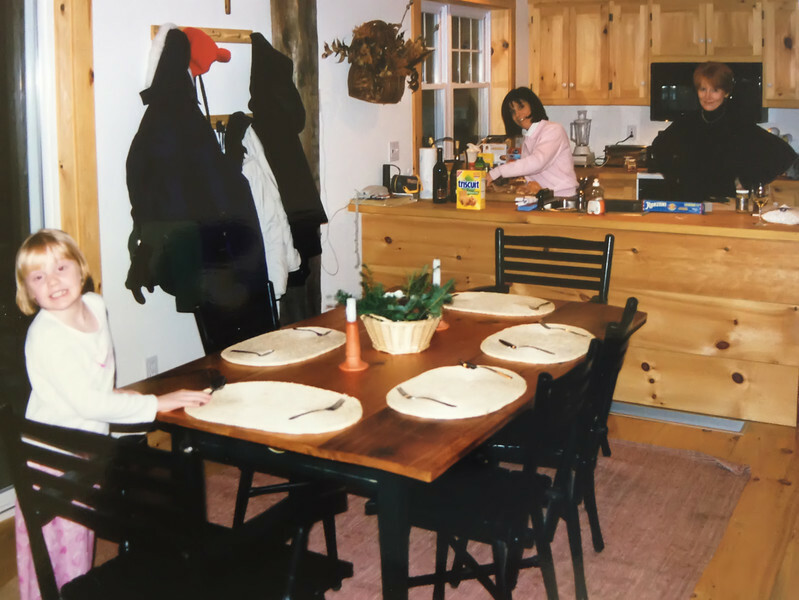 Anyway, going out to dinner up in my beloved part of Vermont requires a good half hour to 45 minutes in the car, and the cabin has a lovely, cozy kitchen, so one night we decided to cook in. There’s Janet cooking, and the Southern daughter setting the table, and me looking all bossy. I have no idea what that’s about. And since we were all tuckered out from our snowy day, we wanted something easy as well as delicious, and yep, you guessed it. Lemon Chicken Pasta! A little cooked and shredded chicken, some lemons, some pasta, a handful of herbs, some butter and we were on our way. A little while later we were eating and laughing around that table up there, and even though it was lo these many years ago, every time I make lemon chicken pasta it zaps me right back to a snowy weekend with best friends. So from me to you, here’s one of my favorites for you to share with good people you love! Cook pasta in heavily salted water until done. Reserve one cup pasta water and drain. Meantime, heat butter in large skillet over medium heat until melted. Add chicken and stir for 1-2 minutes until heated through. Stir in herbs and lemon juice. Add pasta and cheese to chicken mixture and toss. Add just enough pasta water to form a light sauce. Divide among plates, garnish with extra herbs, cheese and lemon slices and serve. Thanks Robyn! There’s nothing like good food and good friends, right? I’ve always loved the lemony buttery sauce that comes with chicken picatta but now that I don’t eat the meat part of it, that sauce hasn’t really appeared in my life in FOREVER. I need it…in the form of pasta sauce. Thank you! And everything is always better with pasta. Or bacon. That’s my motto. Looks delicious. And I concur on the Nestles chocolate cookie recipe. All the recipes we try, we still always go back to the original. Such a great photo of the dish I can taste it :) looks absolutely delicious! Aw, thanks! That is one of my all-time favorite plates! I made this last night and it was a huge hit!! A nice change up from our normal plain spaghetti and parm. Love the lemony flavor. This was so good, my 4 yr old asked to have it again tonight (we just had it last night)! Thanks for sharing! It was so easy to make, too! I forgot to mention, I added some capers too. It was a really nice addition. I made this tonight for dinner, and it was perfect. Thanks for sharing such a nice, comforting recipe! Had a roast chicken in the fridge and was looking for something fun to use it in…so I just whipped some of this up! My 10yo helped and she loved the results. It was quick and easy! I also added leftover steamed broccoli and it went really well with the buttery/lemony sauce. Thanks for this one!! Just came across this on Pinterest–looks delicious! I am a sucker for anything with lemon in it. Looks Yummy and Simple, my favorite kind of meals! if one does not have access to fresh herbs, what would be the dried equivalent measurement be? I think a good tablespoon of each should be just about right. My pleasure! And yes, there’s nothing like the memories of meals shared with friends — delicious in so many ways! This recipe looks great, our household is just getting over a cold and I’m the only one not working today so I’m on dinner duty despite still feeling congested. Needless to say I looked for something that was easy but also that we would still enjoy (last night was pizza night)! I really like your recipe because it creates something of a sauce instead of just squeezing lemon juice over a piece of chicken. And I love the nostalgia that comes with your recipe! It’s very similar to my memory of going swimming every summer day when I was in 4th or 5th grade, and my friend’s mom who watched us while my mom was working would alway makes tuna sandwiches & sweet tea. Anytime I go swimming now I always want a tuna sandwich! Favorite meals make for wonderful memories, don’t they? Hope you love the lemon chicken, and here’s also hoping everyone in your family gets well soon…summer colds are No Fun! Not clear as to how the drained pasta is not a sticky clump by the time you cook the chicken. Made exactly as listed. Had a bit of a bitter taste from the lemon juice. Added some garlic infused olive oil and limoncello to add a sweeter lemon flavor and that helped, but will probably not make again. Also don’t understand why people comment on recipes who have not made it. Not very helpful for those of us wanting to know if it tasted good to those who have actually tried it. Hey Laura! I really appreciate your candid review, and that you took the time to leave this comment. You are right that this is DEFINITELY a lemony one. :) I thought maybe you might be interested in one of our other family chicken pasta favorites, which is this chicken pasta carbonara – link below. Meantime, happy Sunday and have a great week! Very good & love how simple it is. This is one of my picky eaters favorites, so I make it often. Thank you for sharing. I was wondering if it could be frozen and reheated successfully? I have a friend that just had a baby and I’m trying to make her some meals that her other kids will enjoy also, to make life a little easier. Just wondering if I could do that with this pasta? ?